My, my the excitement at Gintime Towers last week was at fever pitch as we unwrapped a surprise parcel from one of our favourite gins, the mighty Hendricks. Inside was the fabled “Hendrick’s Labour Saving Mechanical Martini Mechanism”, a magical mixing device which took three years of research, material sourcing and design trials to perfect. Based on a a piece of arcane bar apparatus dating from the 1930s that was rediscovered by martini maven Craig Harper the new, extremely elegant Mechanism was designed by Hendrick’s Andy Wallace, and is made from hand-blown glass from Italy and secured by an inscribed metal body. It’s simple to operate – the user pumps a handle at the top of the device, which begins the stirring motion of a ladle long enough to reach the bottom of the pitcher. 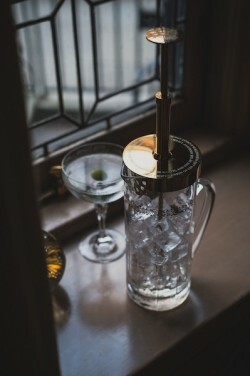 The Labour Saving Mechanism is only available to high-end London cocktail bars who will be able to create a martini using the apparatus on request. A statement from Hendrick’s said: “Requiring just two integral ingredients – gin and vermouth, the Martini is a cocktail that lets the liquid do the talking and when made with the delightfully unusual rose and cucumber infused Hendrick’s Gin, is a cocktail not to be forgotten.